It is a late summer afternoon, the dog days of August; I am cycling up to Cade Street to pay homage at the monument to Jack Cade. It is a windless day and the earth is baking beneath a raging sun. I have half a mind to turn back; my water is already low and I still have the steepness of the road after Marklye. I fleetingly consider Flitterbrook Lane - a more graduated climb – but stay with my course. When I begin the steep climb, I know I have chosen wisely. The trees forming a dense canopy over the road, the sunlight penetrates only enough for the lightest dappling; and, of course, the air is cool. Halfway up, the canopy becomes sparser, so before I emerge into the heat again, I dismount and drag the bike up onto the bank. I sit in the shade and look back down the tunnel of trees, as occasional stray vehicles materialise, camouflaged by sun and shade, to disturb the drowsy, hazy hum of the afternoon. They don’t see me, in the hazel and blackthorn; Jack Cade should have hidden here. 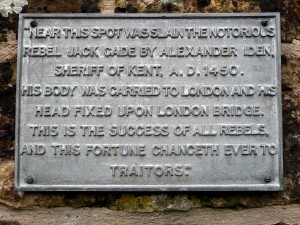 Cade had raised a rebel army that attacked London and the reign of Henry VI; double-crossed by the King, his fatal wounding as a fugitive near Heathfield inspired the revolts of Sussex men. The monument, looking down from the Weald to the sea, stands as a reminder: the city is the seat of authority, the rural landscape is where the spirit of rebellion resides.